This dish is essentially a bigger version of Thin-Roll Sushi — call it Fat-Roll Sushi, if you like. You can use any combo of veggies you like, of course, including pickled daikon and lightly steamed carrots or sweet potato; I just happen to prefer this particular arrangement, which is very refreshing on a summer evening. Make the rice: Follow the directions for making the sushi rice and set it aside. Make the mushrooms: While you're making the sushi rice, soak the shiitake mushrooms in hot water if dried, in cool water if fresh. (The hot water will reconstitute the dried mushrooms; the cool water will lift dirt away from the fresh mushrooms. Soak dried mushrooms for at least 15 to 20 minutes, fresh for perhaps 10 minutes.) Cut off the tough mushroom stems and discard. Thinly slice the mushroom caps and put into a small saucepan with the soy sauce and mirin (you should have enough liquid for the mushrooms to simmer in). Simmer the mushrooms in the soy sauce and mirin for about 10 minutes, then drain the mushrooms in a sieve. Assemble the rolls: Place a sheet of nori on the mat or board. Dip a finger in the vinegared water and run it along the edge of the nori farthest from you. Dip your hands in the vinegared water to prevent the rice from sticking to them. Take a handful of rice and spread it evenly along the side of the sheet nearest to you. Dab a thin line of freshly grated wasabi or wasabi paste across the center of the rice. 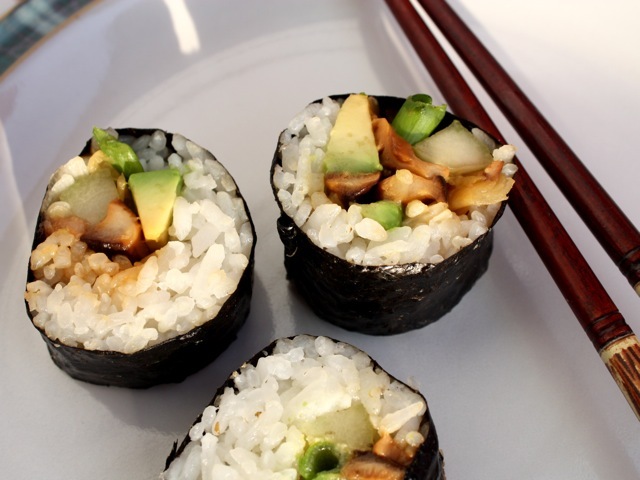 Arrange strips of the pickled ginger, scallions, cucumber, avocado, and mushrooms on top of the wasabi. Lift up the edge of the mat (or the nori sheet) closest to you, and slowly roll the mat (or sheet) away from you. Roll the mat over so that the top edge of the nori meets the edge of the rice. Keep a gentle pressure on the roll to keep it neatly compacted. When the roll reaches the far side of the nori sheet, the wet line you daubed earlier will act as a glue, sealing the roll. Set the roll aside in a baking dish or on a board while you make the remaining five rolls. When all the rolls are done, slice them into 1-inch circles with a sharp, serrated knife. Arrange on a serving plate and serve immediately, with soy sauce for dipping. Culinate editor's note: If you're lucky enough to live in the Pacific Northwest, your grocery store might carry locally grown fresh wasabi root, which looks like a thick knobbly caterpillar. Peel it and grate it finely; the shavings are nowhere near as harsh as the paste variety that most Americans are used to eating with their sushi. The powdered wasabi sold in most supermarkets is generally a blend of horseradish and mustard, with a little genuine wasabi added. However, powder made just from wasabi root is occasionally also available. Follow the package directions for mixing the powder with water to form a paste. Either way, use it as sparingly or as generously as you like, depending on your tolerance level.